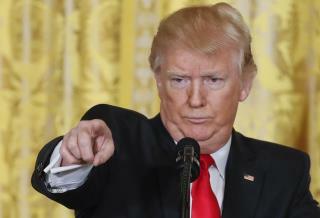 (Newser) – In between lashing out at the media, leaks, and more, President Trump said during a Thursday press conference that a new "very comprehensive order" on immigration and refugees would be coming next week "toward the beginning or middle at the latest," NPR reports. While he didn't give any details on the new executive order, Trump said it will "comprehensively protect our country." According to CNN, Trump said the new order will be "very much tailored" to what he says was a "bad decision" by the 9th US Circuit Court of Appeals, which blocked enforcement of his travel ban earlier this month. Trump's comments suggest the new order will be "narrower in its focus," the Los Angeles Times reports. Gonna ban everyone from all Muslim Countries! Allah be Praised! I hope he expands the ban! Why the ban in the first place? Is there any evidence of imminent danger?